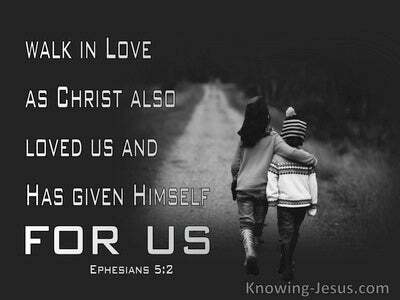 What Does 1 Corinthians 15:55 Mean? God has, by grace, promised those that trust in the Lord Jesus as Saviour the most astonishing riches of His grace and inheritance in His glory, but without the death of our Lord Jesus Christ as payment for our sins we would never have experienced these joys and without the resurrection of our Lord, the power of death and hell would not have been broken – but Christ’s glorious resurrection from the dead is the unfailing assurance of our hope of glory - in Christ. ALL that God has promised to ALL His children is as sure and steadfast as the sovereignty of God Himself. Paul tells us that if Christ had not risen from the dead then our faith in Him would be in vain – but He DID rise. Christ rose from the dead and showed Himself to many hundreds of witnesses – and His resurrection is the First-fruit of all those that are asleep in Him. Christ's triumph over the grave is heaven’s pledge to all of us, that are members of His body, that we too will be raised. Our perishable bodies will be replaced with imperishable bodies - our mortality will put on immortality. 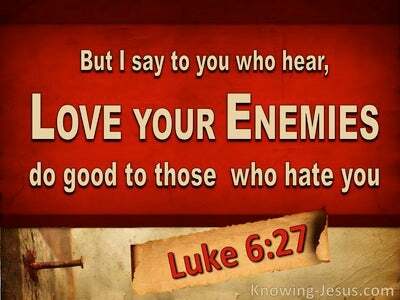 The sting of death is sin, and the power of sin is the law, but thanks be to God, Who gives us the victory through our Lord Jesus Christ. From the fall of Adam, death has claimed many captives. But Christ burst from the fetters of death for the grave had no hold on Him – He brought captivity captive – and we who have been made a new creation in Christ, have God’s assurance that we are a part of that heavenly company. Paul lays out in earlier verses a wonderful, multi-coloured descriptive of all that awaits those who trust Christ as Saviour. 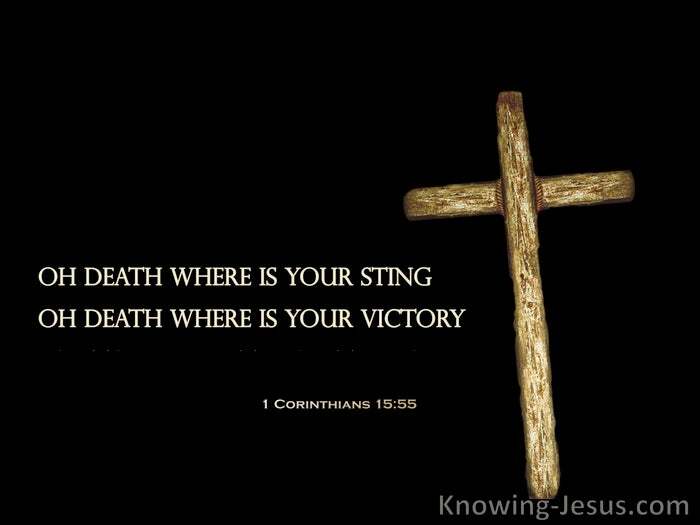 No wonder His edifying and encouraging soliloquy climaxes into this eternal truth - O death, where is your sting? 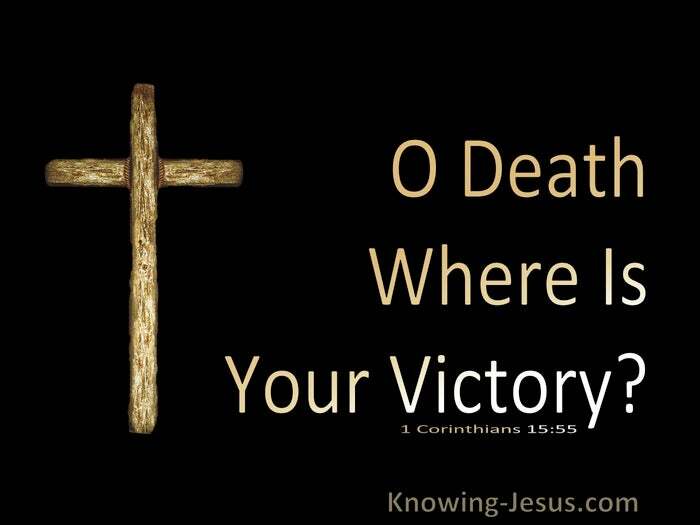 O grave, where is your victory? 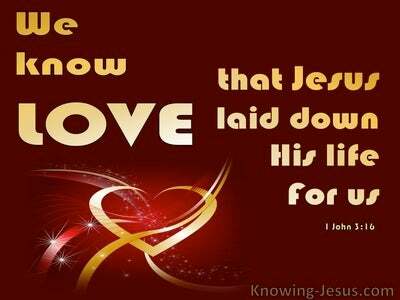 Loving Father, I praise and thank You for Your marvellous plan which You purposed in Christ, that the power and victory of death is swallowed up in Christ resurrection victory, You are worthy of all the praise and glory, in Jesus name I pray, AMEN.